Even though Singer 1409 is affordable, cost cutting is pretty evident from the features and performance. There is a better alternative from Singer itself. Singer 1409 is a very basic sewing machine. It is a machine meant for pure beginners. There are 9 built-in stitches on the machine including 6 Basic Stitches, 2 Decorative Stitches and a 4-step buttonhole. Stitch selection can be done by turning the dial. There is nothing computer controlled, it is just a basic mechanical sewing machine. Stitch length and zigzag width are adjustable. Maximum stitch width is 5mm. Tension adjustment is manual and you can adjust it according to the type of fabric. The reverse stitch lever is conveniently placed, but it could have been larger especially when you consider the large unoccupied space. Presser foot pressure is automatic. Presser feet are snap-on type for easy changing. The free arm mode provides easy access to cuffs and collars. The extra high presser foot lifter is very useful while sewing multiple layers of fabric. Two needle positions are available on Singer 1409. The machine is twin needle capable as well. A manual thread cutter is provided on the side to eliminate the use of scissors. For the price, 1409 has a powerful motor on board. The motor is capable of delivering 750 stitches/min, which is really impressive for such a small specced machine. You have the liberty to sew really fast on this machine. An on board storage space is also provided for storing away the accessories. The machine is pretty lightweight, it weighs around 12 pounds, so portability won’t be an issue at all. You don’t need to spend hours to figure out how Singer 1409 works. It is a simple sewing machine. The machine is pretty good on lightweight fabrics but it is not that good with heavy duty fabrics. The machine has all the basic stitches required by a beginner. There is no automatic needle threader to save eye strain. You will have to use the same technique that has been in use for the past 100 years to thread the needle. There is no 1-step buttonhole. Creating a buttonhole in 1-step is much more easier for a beginner than going through 4-steps. The bobbin is not top drop-in, this means you will have to remove the side cover every time you need to change the bobbin, which is not an easy thing to do for beginners. Singer 1409 seems to be much more noisy than its counterparts, especially at higher speeds. Some users have reported jamming issues. The percentage of such reports are pretty high, so it is not just a one off issue. Singer 1409 will work for very basic tasks. Even then, I really don’t consider it as a great buy (Just go through the features it lacks). The build quality is not that great either. The best alternative I can recommend is Singer 4411. It is a heavy duty model capable of sewing thick fabrics and it has better features than 1409. 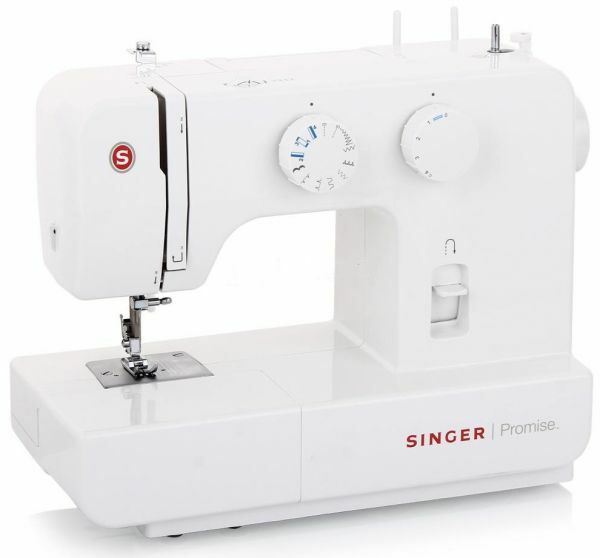 It comes with 11 built-in stitches, top drop-in bobbin and automatic needle threader. Stitch quality is also far better than 1409. It is affordable as well.